200. War … huh, good God y’all … what it is good for? Sitting near the desk was a young woman who we later learnt was Lin from Hong Kong. She arrived in Heidelberg this morning and is going to be attending a conference at the University on stem cells in Lupus disease, starting tomorrow, when we will be on our way to Freiberg. There was also a lady in a smart blue suit. We deduced by her “Guide” badge that if another two people turned up, she would be our guide. So we introduced ourselves and ActorLaddie mentioned that he was a London City Guide. In a nanosecond, he and Christa were swapping guiding stories and the four of us made our way outside and tried to look like really nice people with whom anyone would want to go on a tour. When nobody else did turn up, we asked Christa whether she’d consider doing the tour anyway. At that point, ActorLaddie and I suddenly realised that we were feeling particularly plural today. So I went into the information desk and broke the good news that there were now four people wanting tickets in addition to Lin, paid accordingly and off we headed: Christa, Lin, ActorLaddie, me and the other two. Heidelberg is a very beautiful city in a steep valley. At the top of the valley is a ruined castle overlooking the city; at the bottom the River Neckar. The buildings have an attractive homogeneity due, Christa explained, to war. Again. In this case, it was the War of Succession which had complicated roots involving the young Princess Lisalotte and the younger brother of Louis XIV of France, who was a thoroughly nasty piece of work. I won’t bore you with the details – that’s what Wikipedia is for – but the outcome of the sorry tale was that in the 1690s Heidleberg and its neighbouring towns were completely destroyed – burnt to the ground – by the French troops. 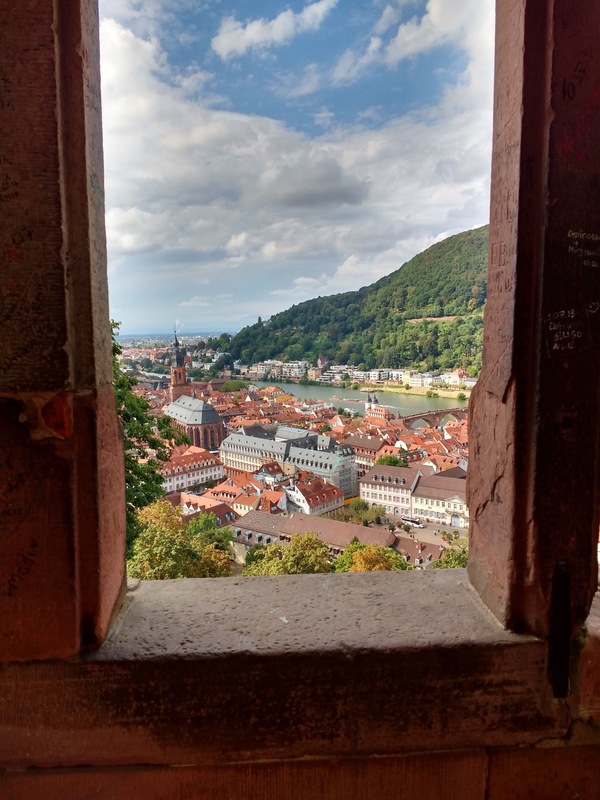 When it came to rebuilding the city after war, Heidelberg was luckier than Cologne and Coventry. The powers-that-be decided that the buildings would be rebuilt in a very attractive light baroque style, which was fashionable at the time. The town hall was built first as a template and other buildings followed suit. The city escaped being damaged in any of the subsequent wars, so it remains beautiful. It has a university dating back to the 1380s – pretty much the oldest in the world after Oxbridge. It represents a book and means ‘always open’. A bit further along, a plaque commemorated those who worked for the University and fell victim to the Third Reicht. Each name has its own story. Christa picked out one to share: Max Freiherr Von Waldberg who supervised the postgraduate studies of a certain Joseph Goebbels who studied there for a Doctorate in Philosophy. Nevertheless, Max lost his job in 1938, dying shortly afterwards and his wife put in an internment camp in France. Which brought the conversation around to the Second World War. Krista shared with us the story of her family taking refuge in 1945 as Russian Red Army moved into her native Silesia and started to take revenge for their dreadful losses on the remaining civilian population. 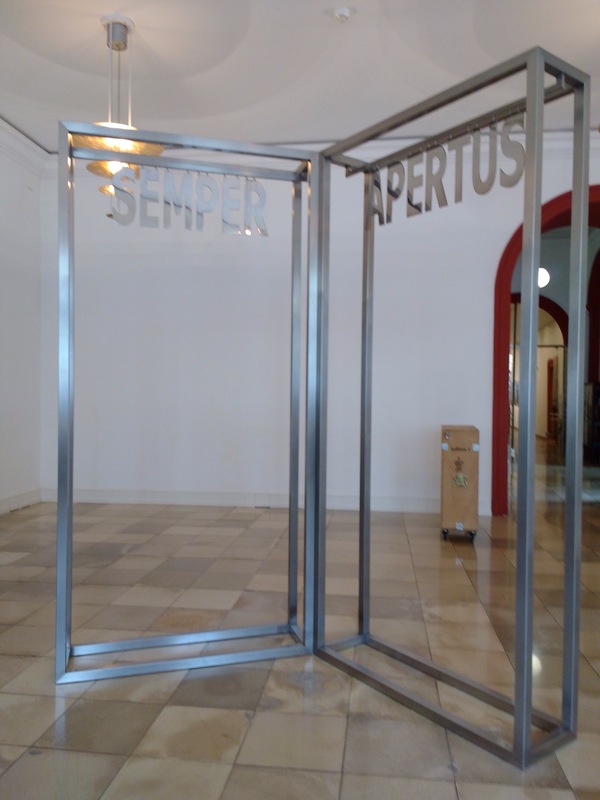 Krista told us how seriously the Germans take the responsibilty to look squarely at the past: when we mentioned Kristallnacht, she said that this is an unacceptable phrase now. It is referred to as the November Pogrom so as not to disguise what happened. 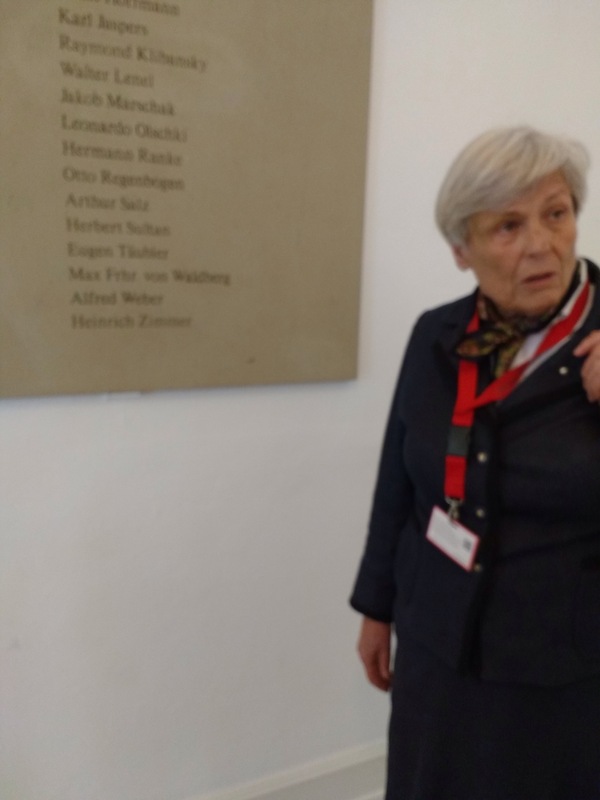 As we talked more widely, she mentioned that her sons had been at Malvern College in the 1980s and, to start with, were badly bullied by the other pupils, who called them ‘Hitler’s sons’. She said what a wonderful thing it was now to see Francois Hollande and Angela Merkel working together to try and solve problems peacefully. Moving on, Krista showed us the Student Prison, where badly behaved university students were held in detention. The walls are covered with the graffiti those prisoners had left to prove that they were there: it became, along with their duelling scars, something of a badge of honour. In all, Krista spent some two hours showing Heidleberg to Lin, ActorLaddie, the other two and myself: far more than there is room to share with you here, alas, as I really need to be sorting out my bits for tomorrow now. A brilliant morning, anyway.